A solution is defined as a homogeneous mixture of two or more chemically non reacting substances, the relative amount of which can be varied up to a certain limit. 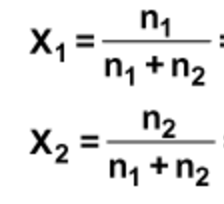 If a solution consist of only two components it is called a binary solution. (1) Mass percent or weight percent :Mass percent of a solute in a solution is the mass of the solute in grams present in 100 grams of solution. (2) Strength: Strength of a solution is defined as the amount of the solute in grams present per litre of the solution. (3) Molarity: Molarity of a solution is defined as the number of moles of the solute present per litre of the solution.It is represented by the symbol, M.
(4)​ Molality :The molality of a solution is defined as number of moles of the solute dissolved in 1 kg of the solvent. It is represented by the symbol m.
(5) Normality : Normality of a solution is defined as the number of gram equivalent of the solute present per litre of the solution. It is represented by the symbol N.
Basicity is the number of displaceable H+ ions present in 1 molecule of the acid. Acidity is the number of displaceable OH– ions present in 1 molecule of the base. (6) Mole fraction : Mole fraction of any component in the solution is equal to the number of moles of that component divided by the total number of moles of all the components. (7) Parts per million: The concentration of very dilute solution is expressed in terms of parts of the solute by mass present in million parts by mass of the solution.